Educator should be familiar with the lab visualizations and tools before beginning the activity with students. This activity can be used to help students become familiar with the mapping tool. After that, many different types of questions can be answered with the tool such as using multiple states for study. Educator may want to expand the chart on the energy priorities worksheet to allow students to take more in-depth notes on their research. Educator may also want to go through the legend and the units of measurement before jumping into the lesson/analysis. If time constraints exist, educator may want to jigsaw the activity by having each group of students explore different energy types, locations, costs, etc., and then present their findings to the class as each energy source and use of Living Lab Tool may require significant research. Alternatively this experience could be assigned as a long-term project. Activity might be more of a challenge if different groups used different states and justified their recommendations to each other, rather than all groups working on the same state. This activity focuses on five key forms of renewable energy: wind, solar, geothermal, hydropower and biomass. 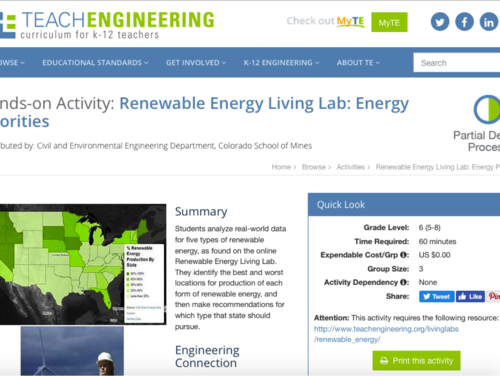 Using data and visualizations from the TeachEngineering Renewable Energy Living Lab (NREL data), the purpose of the lab is to identify which forms of renewable energy are most suitable for students' home states. This activity takes a fairly complex topic - where to find the best locations to develop renewable energy - and asks students to search for answers by using a GIS-based mapping tool. The tool gives results visually and quantitatively, so students can be analytical in their thinking and decision making. This activity engages students in higher-order thinking as they evaluate different locations and energy sources and make a recommendation to the state public service commission. In groups of two, students take the role of engineers tasked with investigating which form(s) of renewable energy their home state should focus on as it recruits new energy companies to do business in the state. Energy priorities worksheet guides students through the investigation using the Renewable Energy Living Lab visualizations and data. Rich list of additional resources provided on the teacher guide. The design and layout are clear. All the materials are provided, including student worksheet, background information, and answer key. The map viewer has changed a bit since the screenshots were made. The instructions still work, but the screenshots look slightly different from the actual tool. Finding specific cities on the mapping tool is not intuitive. In the upper right corner, underneath 'change base map,' click on the circular icon, which when hovered over says 'zoom to a location.' Then type in the city name. Aside from that, the map is intuitive, engaging, and fun to use. Note that the visualization is a beta version - may change over time.